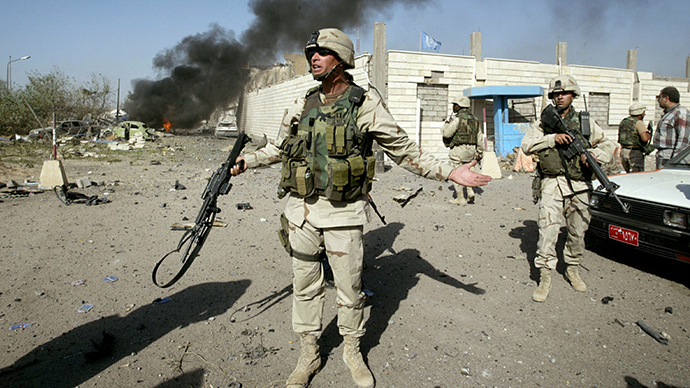 A new survey has found that 42 percent of respondents believe that US forces found active weapons of mass destruction in Iraq after the 2003 invasion, when, in fact, no such WMDs – the major rationale in the push for war – were recovered. The national survey, conducted by Fairleigh Dickinson University’s PublicMind, indicated that Republicans were far more likely to believe WMDs were found following the American invasion of Iraq in 2003, justification for which was fostered by claims made by the George W. Bush administration that Saddam Hussein posed an imminent nuclear threat. Fifty-one percent of Republicans said it was “probably” or “definitely” true that an active WMD program was revealed following the US invasion, while 32 percent of surveyed Democrats said the same. PublicMind noted that the discovery of degraded chemical weapons in Iraq – likely leftover materials from a program that ended in the early 1990s – might explain some confusion. The presence of these weapons was first reported in October 2014. The respondents' chosen news sources also seemed to indicate whether they believed WMDs were found. Fifty-two percent of individuals who said they get their news from Fox said the discovery of WMDs in Iraq was “probably” or “definitely” true. MSNBC watchers were least likely to believe this, with 14 percent agreeing. The survey also probed respondents' belief in President Barack Obama’s US citizenship. Nineteen percent of respondents said it is “definitely” or “probably” true that Obama is not a legal citizen of the US, while 34 percent of Republicans and 30 percent of Fox News adherents believed the same. The survey found that higher levels of political knowledge translated to a less likelihood that respondents would hold false beliefs about WMDs or Obama’s citizenship. Respondents were asked three questions to determine this knowledge: Which party currently controls the House of Representatives? What are the three branches of government? Name the Chief Justice of the Supreme Court. PubicMind reported that one-third of respondents answered none of the questions correctly, while 26 percent got one right, 27 percent got two right, and 13 percent got all three right. Higher levels of political knowledge, based on the answers to those questions, corresponded with lower levels of belief in WMDs in Iraq or Obama’s non-citizenship. Twenty-one percent of those who got none of the three questions correct believed Obama is “definitely” or “probably” not a US citizen, and 46 percent of them said that active WMDs were found in Iraq. Among those who got all three questions correct, the percentages were 13 and 20 percent, respectively. The poll included 964 respondents contacted by both landline telephones and cell phones from December 8 through December 15, 2014. The survey has a margin of error of +/- three percentage points.